La Bufadora Travel Information. Tourist Attraction in Ensenada, Baja California. La Bufadora is a marine geyser provoked by a unique combination of geology and wave action. Violent waves coming from the Pacific Ocean are driven via a natural underwater canyon directly to a cave at the base of a cliff south of Ensenada city. The water and colliding air are forced to be expelled through the only exit... a narrow basaltic notch. A spectacular shooting spray of water explodes up in the air, dissolving into a cool mist that cascades back down onto people watching. Almost every minute water and air are launched upwards producing a thunderous roar. This spout of marine water reaches up to 85 feet above sea level. This fascinating marine geyser is the second highest on earth, after the one in Hawaii. La Bufadora is also the name of the village surrounding this spectacular marine geyser. The hand of Nature has carefully scooped a beautiful crescent shaped bay from the land just south of the blowhole. It is a perfect anchorage that is protected from the northern winds and swells. Many of the weekend and retirement cottages are situated on a sloping bluff above the ocean, crowned by small windmills and black solar panels that help the residents fully utilize the area's natural amenities. Most of them are USA and Canadian retirees. Some of the other residents are fishermen or charter skiff operators who cater to the needs of anglers and scuba divers. The earth behind this little sea village quickly rises several hundred feet to form a huge, dusty brown hill from which the marvels of many miles of wild coastline can be observed. To the east, the hill provides an unobstructed view of the massive Sierra Juárez that stands as a barrier between Ensenada and the Sea of Cortes. Copious numbers of quail, rabbits and rattlesnakes still blend into the chaparral. And the skies are patrolled by soaring red tail hawks. The bold, thrusting lances of flowering yucca plants and succulent cacti stand in stark, solitary challenge to the brilliant blue canopy above them. In spring and early summer the hillsides are often smeared with a mustard yellow hue from scores of small wild flowers that bloom brightly in the sunshine. Here, where warm winds blow, the fish always seem to be biting and the lines of pelicans can regularly be observed soaring only inches above the surf, you will want to stay longer. Whether you come to rent, to lease or buy, or as a weekend tourist, there are countless outdoor activities in La Bufadora. If you like boating, fishing, camping, kayaking, hiking, biking, surfing, snorkeling or diving... this is an exceptional location. In this natural hideaway visitors take advantage of the abundant marine life that still exists in the waters surrounding its rugged topography and its many hidden coves. 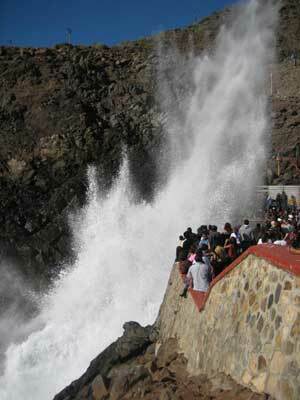 The Blowhole is located 18 miles south of Ensenada, at the tip of Punta Banda. Punta Banda is a narrow mostly barren finger of land that pokes out into the Pacific Ocean at the southern end of Bahia de Todos Santos. Bahia de Todos Santos is where the city of Ensenada is nestled. While driving south on highway #1, look for the "Maneadero" sign and the "La Bufadora" sign. Turn right to the west. You will encounter signs that will guide you all the way to this awesome location. Hire a taxi in Calle Primera, in Ensenada downtown. The round trip fees are really cheap. End of La Bufadora Travel Information.